Welcome to Mr. Gus's Journal: When you're at your worst, count your blessings. I really feel compelled to tell you my story, or at least some of the highlights. For now, I'll just share a snippet. It seems like this past decade has had some of the worst and some of the best times in my life. In 2000, and then again in 2001 I lost my Dad, then my Mom. Then by 2002 I had a near job lay-off, and a divorce. A psychologist told me that each incident was enough to bring any person to the brink of depression, drink or just plain giving up, so I was trying to deal with these setbacks, trying to keep my sanity. I had a buddy that got me involved a bit with the Catholic church, just long enough to learn some of their ways by reading a couple of books and attending a mass or two. During the process, I somehow ended up with some Rosary beads. Of course, I didn't know any of the formal Catholic prayers, but I loved holding the cross. It made me feel peaceful. My original Rosary was made of wood, I've since purchased several more. One night alone in bed, lonely as could be, contemplating all of the crap I was going through and about in tears with despair, I clutched the Rosary beads. I had heard that when you’re feeling down to count your blessings, so I started doing that, naming one blessing per bead as they slipped through my fingers. I know I went around the loop for sure one time, perhaps two, naming blessings one-by-one. I first listed my children, then my siblings, then my dog, job and friends. Before I knew it, I felt better. The neat thing about using the beads to count each blessing was that when I was done, I could look at something tangible and visually identify a whole bunch of things I should be thankful for. I still use the beads to this day in the same way. 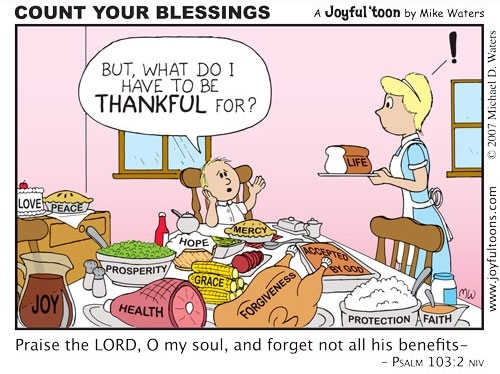 I also love this old hymn sung in many churches called “Count our blessings”. Here's the first verse.